2010 America the Beautiful Five-Ounce Silver Set – Only 7 Exist! 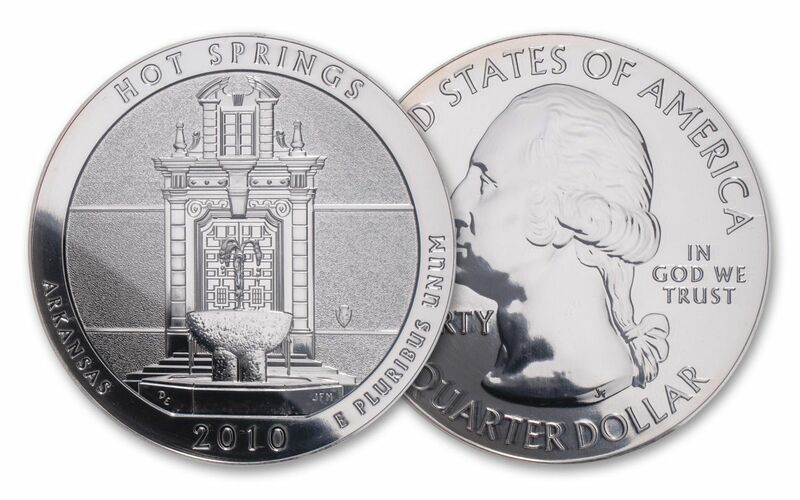 The successor to the U.S. Mint’s mega-hit States Quarters program, the America the Beautiful Quarters® program brings one-year-only designs that feature some of the nation’s most beautiful parks and monuments. 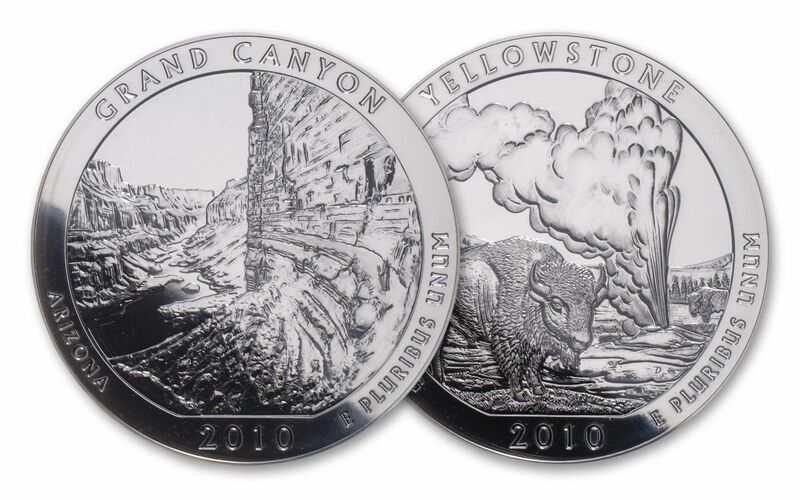 In 2010, the U.S. Mint began striking its first-ever five-ounce, three-inch, 99.9% fine silver bullion coin series – massive versions of the America the Beautiful quarters! Each is still official U.S. legal tender and allows you to examine each beautiful design in minute detail. This set brings together all five of the first-year 2010 releases – Arkansas: Hot Spring National Park, Wyoming: Yellowstone National Park, California: Yosemite National Park, Arizona: Grand Canyon National Park and Oregon: Mt. Hood National Forest. Each has been certified by the Professional Coin Grading (PCGS) as being in near-perfect Mint State-69 Deep Mirror Proof Like (MS69 DMPL) condition, a distinction that means your almost-flawless coins will showcase impressive full strikes and indistinguishable imperfections – well above and beyond the quality of the vast majority of coins in the series. In addition, PCGS has certified that each coin is a First Strike (FS), meaning that your coins were among the first struck by the mint and were verified within the first 30 days of issue! All five of your coins have also been sonically sealed in acrylic coin holders and include another exciting feature: a label personally signed by John Mercanti, the U.S. Mint’s 12th Chief Engraver! Each if these coins are struck for only 10 weeks and 10 weeks only so that the mintages are relatively low. In fact, the combination of their limited editions, grade and Mercanti signature means that only seven of these sets exist! Be one of the few collectors to call it your own and secure your set today! 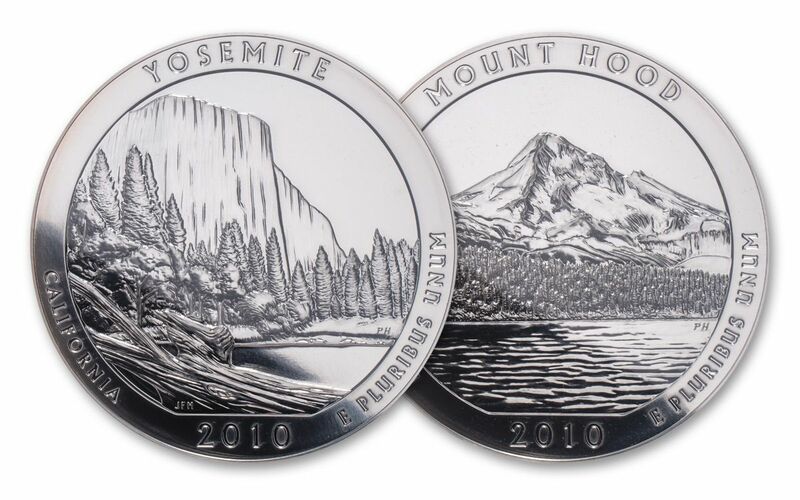 COMPLETE FIRST YEAR OF THE AMERICA THE BEAUTIFUL SERIES – This five-coin set represents the very first year in the U.S. Mint’s America the Beautiful series depicting national parks and other national sites. STUNNING NATURAL SCENERY – The designs include Hot Spring National Park in Arkansas, Yellowstone National Park in Wyoming, Yosemite National Park in California, Grand Canyon National Park in Arizona and Mt. Hood National Forest in Oregon. A SERIES OF FIRSTS – Each coin in the America the Beautiful series was struck at the Philadelphia Mint from five ounces of 99.9% fine silver. These are the largest ever quarter coins struck, measuring three inches in diameter. GRADED IN NEAR-PERFECT UNCIRCULATED CONDITION – Your coins have been graded by the Professional Coin Grading Service (PCGS) to be in Mint State-69 Deep Mirror Proof-Like (MS69 DMPL) condition, a distinction that means your almost-flawless coins showcase an impressive full strike and indistinguishable imperfections – well above and beyond the quality of the vast majority of coins in the series. KEY FIRST STRIKE CERTIFICATION – Your coins will also be certified as First Strike (FS) coin by PCGS, meaning that they were among the first struck by the mint and were verified within the first 30 days of issue. AN AUTOGRAPHED LABEL! 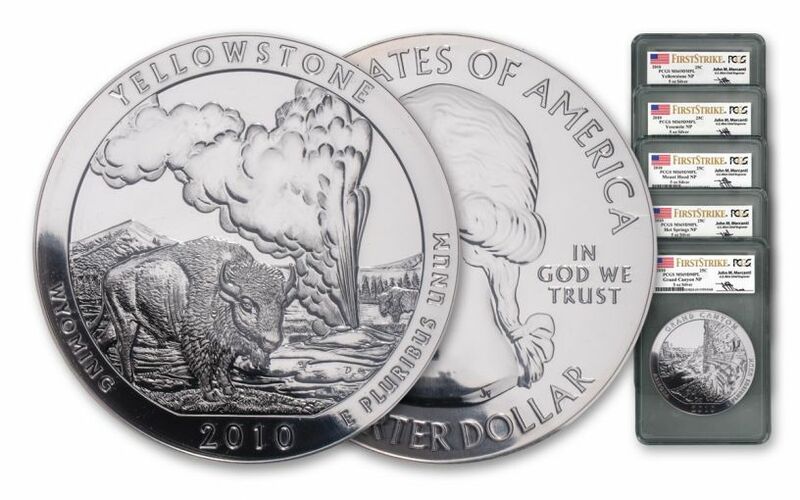 – Your 2010 America The Beautiful Five-Ounce Silver Coins will also be sonically sealed in acrylic holders with a white a label hand-signed by the 12th Chief Engraver of the U.S. Mint John Mercanti! The America the Beautiful series has proven extremely popular since it began back in 2010. 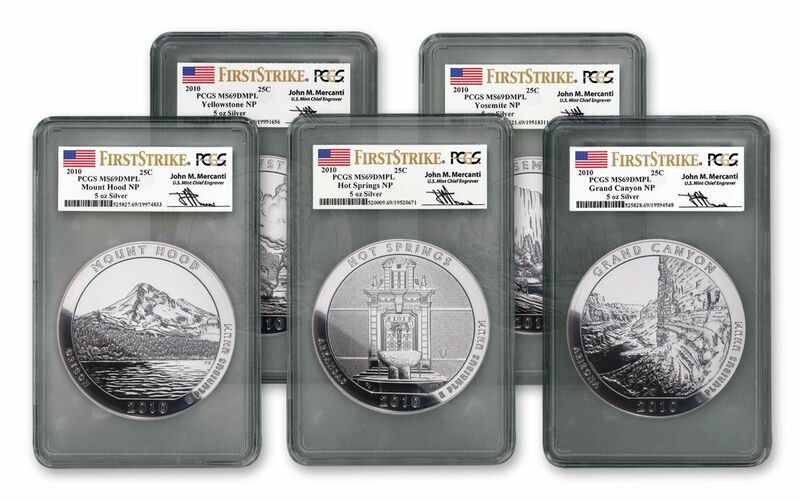 Although these coins are considered bullion, each new release is available for only a short time long, so add this set of Mint State-69 Deep Mirror Proof-Like (MS69 DMPL) First Strike (FS) 2010 America the Beautiful Five-Ounce Silver Coins to your collection before it’s too late!